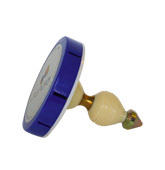 Our diabolos are precision made, with parts matched before assembly to assure balance for smooth spinning performance. Fixed wide axle for finger tricks and grinds. Preferred by beginners and advanced diaboloists. Extra long spin time for the advanced performer. 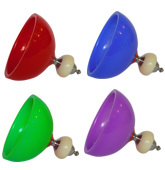 Centers of our diabolos are constructed with polyamid cones for greater wear. 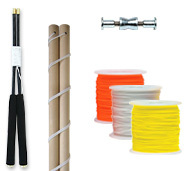 Diabolo handsticks are hardwood in white gloss finish with custom braided polyester cord. 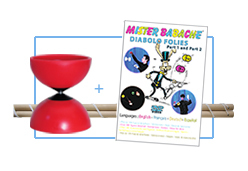 Each diabolo includes a handstick set, one additional string and a basic instruction sheet. The 5-inch Finesse and Harlequin diabolos are considered the standard for experienced diaboloists. 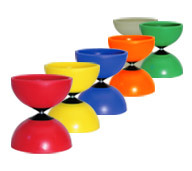 The Performer diabolo is super-sized for performers who work with really huge diabolos. 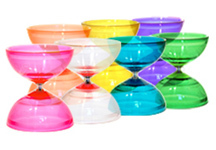 Finesse, Performer and Millenium models are made from lightweight, translucent elastomers. Harlequin and Arlequino diabolos are made from natural rubber. 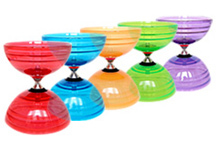 We have the right diabolo for any performer.